I’m following the Wardrobe Architect series to help me build a well curated collection of hand-made clothes. You can find all my Wardrobe Architect posts in their own category. I’m very keen to see and talk to others working through this series, so share with me, if you are. 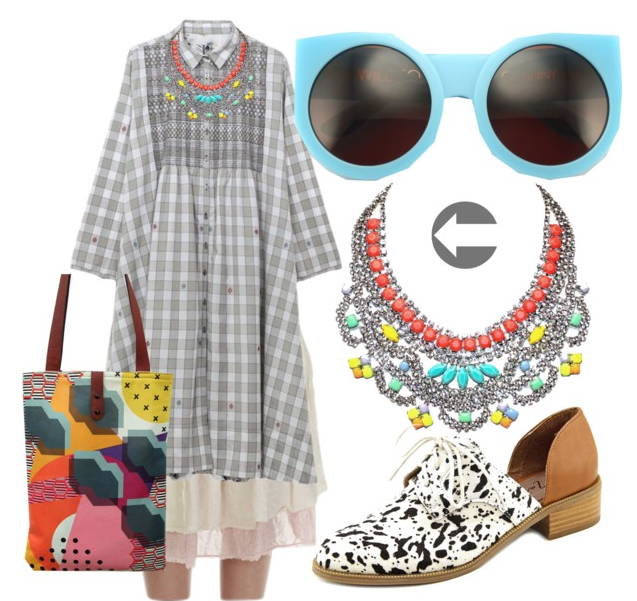 This week I tackle pattern and prints. Probably my favourite thing about clothes. I have used these five terms to describe my core style. So, obviously pattern is something I’m not shy of. I probably get the most joy out of outfits that have lots going on. I would love to wear these looks. Wearing this much pattern though, requires a large wardrobe or a limited palette (like the centre picture) to pull off. I probably deserve to have some outfits like this, that make me feel great, but I don’t think I can afford a whole wardrobe of crazy patterning. This is where I diverge from the Wardrobe Architect series a little. Sarai Mitnick has us think about what percentage of our wardrobes are plain and patterned and which types of pattern we like to wear. I will get to that in a future post, but for today I wanted to explore how and where I wear pattern. The way I wear pattern most, is in one or two stand out items. If it’s in a shawl or other accessory, I want a quieter background for it to stand out against. That doesn’t mean no pattern in the rest of the outfit. The dress on the left has a small check, embroidery and contrast panels. I also love Gudrun’s polka dot undershirt; it looks great with the t-shirt on top, to show off the colours and patterns in the scarf. Where Do I Wear Pattern? In a scarf, necklace, cowl or shawl. This is an easy way to add pattern to an outfit and I have a large collection of shawls. I can wear them with patterned bags and shoes too. I love to knit my shawls but I love a beautiful woven or embroidered shawl too. I think I could sew some interesting shawls. Such as a dress, tunic or coat, with plain legs. I would love to wear patterned tights but I never find them flattering on me, so it makes sense to steer clear of them and use my dress or coat as a large patterned area. Such as an undershirt with a quiet tunic on top or a longer length slip dress. I have mostly plain undershirts because I find it easier to get the fit I like in them. But I could add some patterned undershirts underneath some of my quieter tunics. I like them to fit really tight; no added bulk. This combination at Gudrun Sjorden looks great but would look sloppy on me. I usually buy my undershirts but I think I will make a couple in patterns for this winter. Handbags, shoes, brooches, necklaces. In these small areas, I think they can clash happily. Where I prefer to avoid Pattern? Tights, trousers and leggings. I love this look but I am self-conscious of my short, full legs and feel that pattern attracts too much attention to them. Instead I prefer to keep a selection of jeans and coloured tights on hand. I had been considering finding a trouser pattern that I liked the fit of, so that I could have patterned bottoms. But, that will distract from the areas that I’m happiest wearing print. I think I’ll avoid patterned trousers now. I love large prints but I am a little shy to wear them. However, yes, to large print scarves. I like patterned trousers, always have. I have few patterned dresses, pattern tends to be in separates. Once again I’m in awe of your eye for excellent outfits! I love layered pattern, but rarely achieve it. My wardrobe might need some architecting. By the way, I really enjoyed hearing you on Pomcast. Would love you to do a Velvet Swans Podcast….. Thanks Jennifer. The podcast world seems very crowded. Have you listened to the Seamwork podcast or While She Naps? Both very good sewing podcast. I enjoy Seamwork and must check out while she naps, thanks for the tip. There’s always room for some Juju magic out there in podcast land! 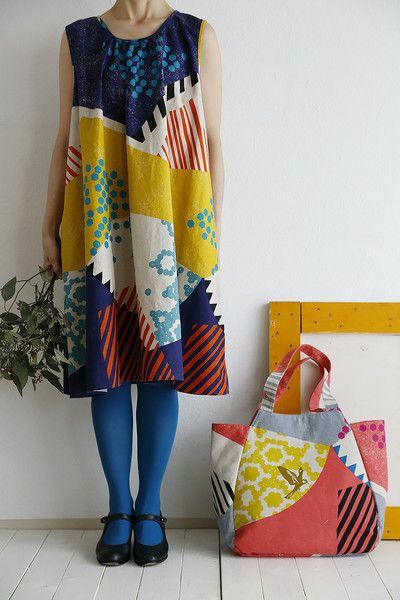 Please- what is the source of that great dress/ fabric in the example photo for “In a Large Piece…” I love that! Oh, and YES to the idea of a Velvet Swans pocast! After working in an apple store for 9 years I had no actual clothes that were not jeans or apple logo shirts! No longer young or thin and definitley not traditional I found my wardrobe needed a complete overhaul. ( many ‘what was I thinking moments here.) Blogs like yours make it fun. 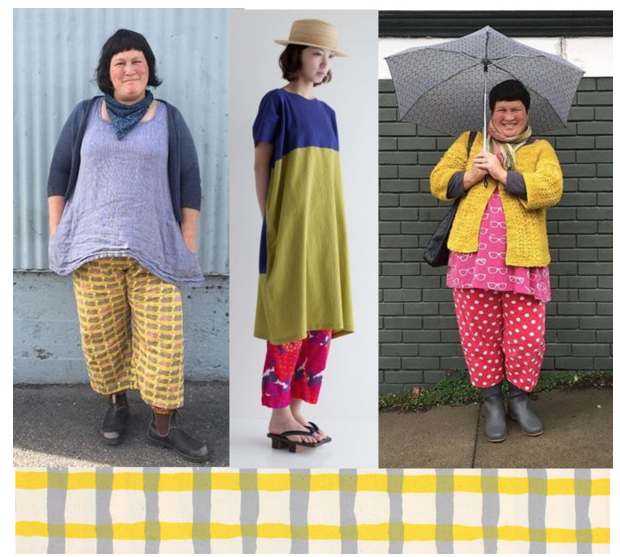 I am following your Wardrobe Architect series and you are inspiring me to get moving. I love polka dots and will be looking for more of those and I am also thinking alot about painting my own fabric. This will be fun! Like you I like dresses with fitted tops that flow outward to balance my matronly endowment. I like to make my own patterns and I just bought some navy with black dots in a knit. sounds like we have a lot in common Martha!